Our legendary FJR has many features to accommodate the requirements of our customers. Making it easier to use, and more comfortable while still maintaining the performance, handling and power characteristics that make it so much fun to ride. The YCC-S (Yamaha Chip Controlled Shifting) system provides effortless city and stop and plus increased open road comfort thanks to its “auto” clutch. We have also addressed numerous customer requests by designing an air flow management system that reduces the amount of heat to the rider. The bike is more adaptable to an individual’s riding preference with an adjustable handlebar and seat. 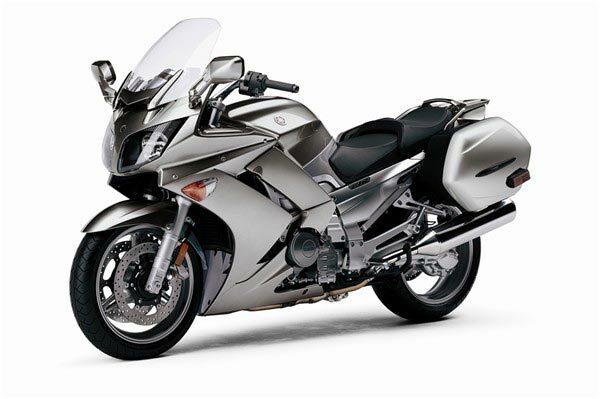 Bodywork, lights, mirrors, and instrumentation raise the level of quality once again, while a unified braking system with standard ABS add to the FJR’s exceptional functionality. 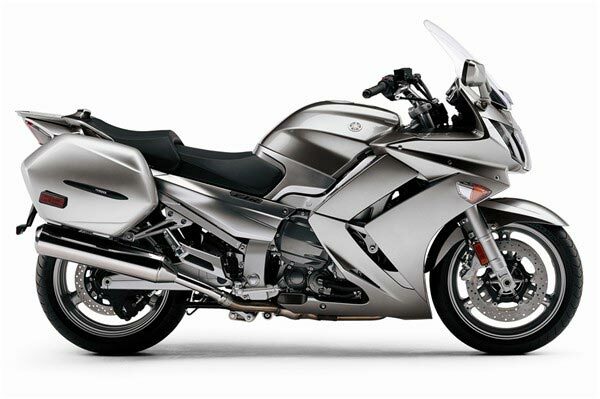 – 1298cc, DOHC, 16-valve, liquid-cooled in-line four engine delivers massive power and torque (145 hp @ 8500 rpm and 99.1 ft-lbs of torque @ 6000 rpm) for an unequaled spread of muscle over a wide RPM range. Red line is a low 9,000 rpm for extended engine life. – Engine is a fully stressed chassis member, allowing for a lightweight frame design. 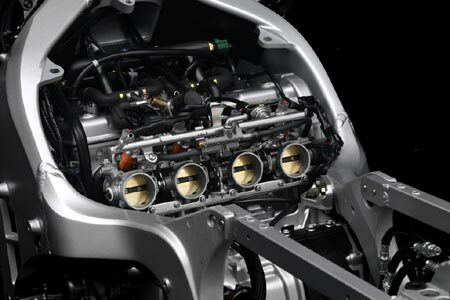 – Specially designed four-valve per cylinder head features compact, side-driven double-overhead camshafts providing outstanding low to mid rpm torque and horsepower for effortless sport touring and effortless passing power. – Advanced electronic fuel injection (EFI) system is ideal for long-distance sport-touring. The 42mm throttle body fuel injection system with 4-hole Nippon injectors delivering crisp, seamless throttle response regardless of weather or altitude. This system also enhances fuel economy, reduces emissions and offers instant, choke-free starting. – EFI system features a Throttle Position Sensor (TPS), which monitors throttle position and, in conjunction with a variety of sensors (air intake temperature/pressure, atmospheric pressure, coolant temperature, crankshaft position and engine rpm), ensures precise injection intervals and ignition timing for optimal engine performance. 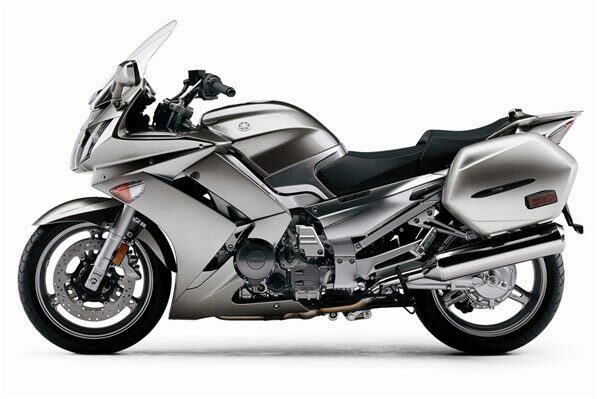 – Revolutionary wide ratio, 5-speed transmission with newly designed Yamaha Chip Control Shifting (YCC-S) utilizes widely spaced gear ratios to deliver relaxed long-distance sport touring performance combined with seamless acceleration … all without a have to engage or disengage a clutch. – Yamaha Chip Controlled shifting (YCC-S) is an industry first on a sport touring machine. The most noticeable difference is the lack of a clutch lever on the FJR1300AE. The YCC-S system uses two electronically controlled actuators … one for the clutch and one for shifting. The rider has the option of shifting with via a conveniently located handlebar switch or using the conventional foot shifter. The big difference is there is no clutching involved. Shift changes are smoother than a conventional manual clutch system and the foot shifter effort has been reduced with this system. The benefit is improved rider comfort due to the elimination of clutch hand fatigue especially in stop and go traffic plus reduced foot shifter effort. NOTE: This system is not an automatic shift system … the rider still must shift the bike, but without worrying about the clutch. – Special scissors-type primary driven gear helps prevent drivetrain backlash and significantly reduces transmission noise for great rider comfort. – 4-into-1-into-2 stainless steel exhaust optimizes engine performance across the power band and utilizes four three-way catalytic converters to reduce emissions. Two are located in the junction “box” under the engine and one in each muffler. 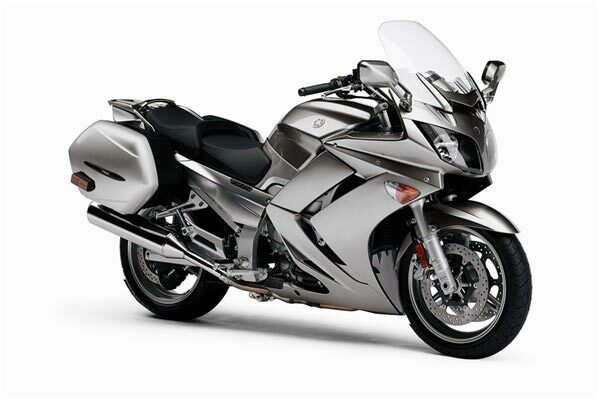 Combined with the Air Induction System (AIS), the FJR1300AE is one of the cleanest-running large-capacity motorcycle engines ever built. It easily exceeds the strict European EU-3 emission standards. – Heated oxygen sensor (O2) provides precise fuel – air ratio information to the fuel injection system to reduce emissions even further, especially at lower engine temperatures. – Curved radiator uses twin “ring-type” fans for great heat dissipation and to aid in moving the hot air out of the cowl area for optimized air management and less heat to the rider. Ring type fans “pulls” more air than a conventional type fan. – Dual 320mm front discs are squeezed by Nissin 4-piston calipers with independent brake pads for each piston. Computer controlled ABS is now standard on the FJR1300AE. – Unified braking system with computer controlled ABS. When the front brake is applied, all 4 – LHS front caliper pistons are activated, while only the “upper” two pistons on the RHS front caliper are activated. When applying the rear brake, both rear caliper pistons are activated plus the two lower pistons on the front RHS caliper. 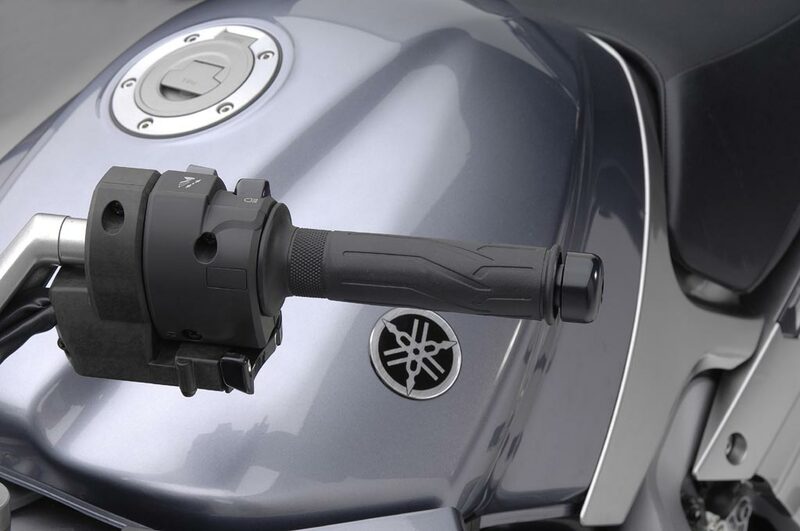 – Adjustable handlebars offers three positions of adjustability. From the centre position, the bars can be adjusted 5.5 mm forward or 5.5 mm back towards the rider. Total adjustment range is 11 mm. – Middle cowl features a 2 – position adjustable visor / vent. The adjustment range is 30mm via quick turn fasteners. The rider can adjust these vents (30 mm / 1.2″ range) to allow more or less air toward the rider’s hip and leg area. – Electrically adjustable windscreen was totally revised in 2006. The windshield features a fresh air duct at the bottom to reduce the vacuum tendency (negative pressure) in the cockpit area. The range of height adjustment is 136 mm (5.4″) The windshield can be easily raised for greater wind protection or lowered for a sportier profile via a convenient handlebar-mounted switch. – Quick-release luggage mounts mean fast removal of the 30 litre colour matched hard saddlebags. The FJR1300AE has been designed to look great with or without the saddlebags installed. It takes mere seconds to install or remove the locking saddlebags or optional top case. – Easy-to-read instrumentation includes an electronic analog speedometer and tachometer, LCD digital odometer, dual tripmeters, fuel and coolant temperature gauges, plus a clock as well as a range of warning lights. Other functions include outside air temperature, a gear position indicator and fuel consumption read out. The speedo and tach feature stylish chrome accent rings for a stylish appearance.